April-October 6.30pm or 7.30pm departure for the gondola ride with dinner afterwards. Avoid the peak Summer season if possible to enjoy a more relaxed atmosphere. We are comparing Venice Gondola Ride and Serenade with Dinner Prices from leading ticket suppliers and Try to find you Cheap tickets prices on the market. 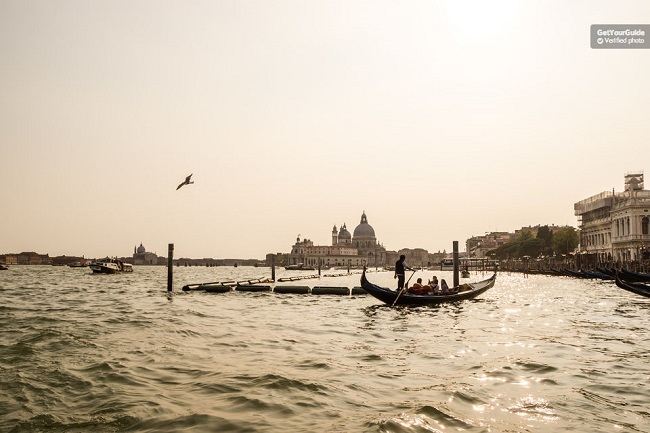 A quintessential Venetian experience, one that people dream about doing. Ride in a traditional gondola with a licensed gondolier and be serenaded by an opera singer and accordion player as you glide along the smaller backstreet canals and along a section of the beautiful Grand Canal, riding under bridges and past churches, and mansions. Afterwards you\'ll enjoy a delicious Italian dinner which rounds off a wonderfully romantic evening in this must-visit city. Depending on the restaurant chosen at the time of booking, you\'ll be able to dine on a main dish of seafood tagliolini, spaghetti with cuttlefish ink, bolognaise gnocchi, lasagne, mixed friend fish, or Venetian style escalope with a side dish of salad, fries, or grilled vegetables. An unforgettable way to enjoy a romantic evening in Venice – Perfect for couples. If you want to experience Venice in the most iconic way, book this tour! The best way to experience a gondola ride plus dinner if you\'re on a budget – This might seem expensive but arranging it independently costs even more! Your Experience With Venice Gondola Ride and Serenade with Dinner? Meet your gondolier at the designate place and take a seat in the traditional gondola for a 30 minute serenaded journey along parts of the Grand Canal and through the quaint back waterways. You\'ll be serenaded by an opera singer and an accordion player as you delight in the sights of Venice. After the gondola ride you\'ll need to make your own way to the chosen restaurant where, depending on the option booked, you\'ll enjoy a 2 or 3 course traditional Italian meal. End the evening as you stroll hand-in-hand with your loved one back to your accommodation after a delightful evening. What Venice Gondola Ride and Serenade with Dinner Includes? 30 minute gondola ride on the Grand Canal and smaller waterways. A traditionally dressed gondolier with opera singer and accordion player. 2 or 3 course dinner in a nearby restaurant. Book with GetYourGuide to enjoy a private gondola ride – Other booking sites sell shared gondola rides with dinner. Print 2 versions of your booking voucher – 1 for the gondolier and 1 for the restaurant. Travelers Reviews about Venice Gondola Ride and Serenade with Dinner? Travellers talking about this tour on Tripadvisor, Viator, and Get Your Guide give it mixed reviews. Everyone agrees that the serenaded gondola ride is perfect, but the restaurant reviews vary – Some bad experiences started with getting lost trying to find the restaurant, always sure to put a damper on things, and rude staff. Others had no problem and report a fantastic, romantic evening in Venice. Reviews seems to vary depending on the restaurant booked plus some overly-high expectations. The gondola part of the tour is not accessible for wheelchair users or people with walking disabilities. Arrive at the gondola meeting point 10-15 minutes before departure. The tour does not operate in the case of exceptionally bad weather or a gondolier strike – Check your email before you leave. Print your booking voucher – E-tickets are NOT accepted. Check booking confirmation – Varies depending on option booked and booking company.